APM Terminals Pipavav, selected 62 apprentices from among 140 applications received from local youth. The objective of the apprenticeship training is to hone the technical and soft skills of the qualified unemployed youths to enhance their employability in future. Additionally, they will be educated in HSSE (Health, Safety, Security and Environment) and work ethics to make them industry-ready. 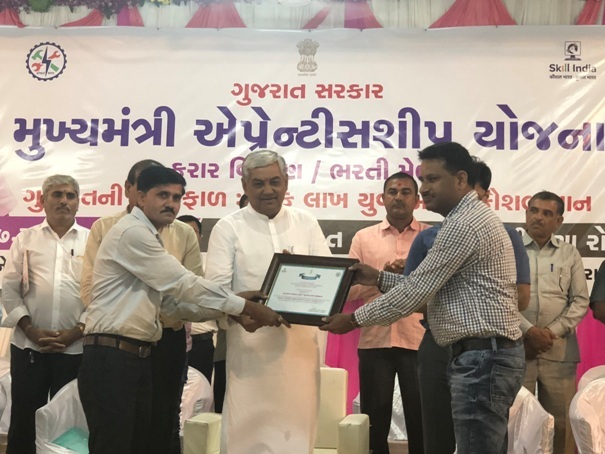 As an appreciation of the efforts taken by APM Terminals Pipavav in skill development of the local youth, the honorable Minister for Agriculture, Gujarat State Mr. R.C. Phaladu awarded an appreciation certificate to APM Terminals Pipavav under the ‘Mukhya Mantri Apprenticeship Yojana’ felicitation program.